Yellowstone Park is blessed with gems you can see but not purchase. Yet they are priceless. 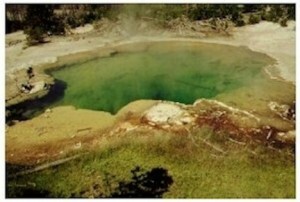 The ones I’m thinking of are Emerald Spring and Emerald Pool. Most deep hot pools are blue, because their water absorbs all colors of sunlight except blue, which is reflected back to our eyes. Emerald Spring at Norris Geyser Basin, however, is lined with yellow sulfur, so when combined with the blue of the water, that gives us green. This spring has a somewhat acidic pH, and its temperature has varied from around 181ºF to 196ºF over the years. Its frequent turbulence comes from gases like carbon dioxide, but on occasion it has heated up enough to erupt as a geyser. 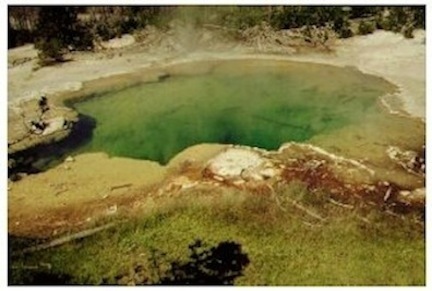 In fact, in 1931 its nearly constant eruptions could reach 60 to 75 feet, according to geyser expert T. Scott Bryan. 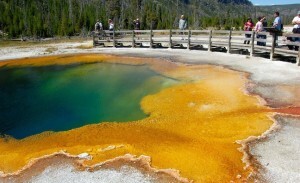 Much larger and even more beautiful is Emerald Pool at Black Sand Basin, near Old Faithful village. Its color comes not from a sulfur lining but—being too cool to act as a geyser (about 144ºF to 156ºF) and not acidic—yellow bacteria can grow happily here. This accounts for its gorgeous green color and yellow surrounding bacterial mats. Black Sand Basin has got to be my favorite easy walk. In less than a mile of walking you can enjoy a welcoming geyser (Cliff Geyser), which may be erupting as you get out of your car, then Rainbow Pool and Sunset Lake to the north. Save the crown jewel, Emerald Pool, on its own short boardwalk, for the last. Yellowstone Park Historian Honored Anew! Comments Off on Yellowstone Park Historian Honored Anew! Montana State University has recently announced that two honorary doctorate degrees will be awarded on May 3rd in Bozeman. Recipients of honorary doctorate degrees at this year’s commencement will be Donna Shalala, the Secretary of Health and Human Services under Bill Clinton in nursing, and Lee Whittlesey in history. Among Lee’s many books about Yellowstone perhaps the most popular are Death in Yellowstone and Yellowstone Place Names (both in their second editions). His complete compendium of research on names, Wonderland Nomenclature, is enormously useful to researchers like me in learning the origins of former and present park names. Lee, 63, has served YNP for over forty years in many capacities, including tour bus driver, ranger, and park archivist, becoming Yellowstone Park Historian a decade ago. He holds a master’s degree in history from MSU and a law degree from the University of Oklahoma. He has already landed one honorary doctorate from Idaho State University. I am proud to call Lee a personal friend, and his help toward my several Yellowstone projects has been invaluable. I’ve been neglecting my blog lately, writing about once a month instead of meeting the once a week goal I had set for myself. It’s not as if I weren’t thinking about Yellowstone most of every day. But most of that thinking, reading, and writing are related to my book projects rather than to my online presence. I just came across an interesting article by Brett French, the outdoor editor at the Billings Gazette, whose writings I’ve admired for several years. It’s about the Howard Eaton Trail in Yellowstone. Brett interviewed two of the best current authorities on old trails and roads, Leslie Quinn of the Xanterra concessionaire, and M.A. Bellingham, who volunteers at least one day a week, working for Park Historian Lee Whittlesey. Howard Eaton was a rancher from near Sheridan, Wyoming, who led horseback parties though Yellowstone from the mid 1880s for something like forty years. 1883 was when one could first send horses to the park’s northern edge by railroad. Brett’s article did not mention that this trail was laid out by a New York horsewoman named Mrs. Robert C. Morris (in the days when married women did not use their given names in public media). In June of 1917—the year after the park was opened to automobiles—Mrs. Morris, who had a ranch near Yellowstone, began to “map out an elaborate system of trails through the park, which will make it possible for visitors to ride through the most beautiful and picturesque portions of the great ‘reservation,’ journeying in an unhurried and enjoyable fashion, seeing much that cannot be seen from the motor roads alone, and never once traveling on the motor highways.” This quote comes from the New York Times Magazine for February 10, 1918. Mrs. Morris used existing trails, but most of the work of her pack train, which covered 1,500 miles in the park, was in finding connections and marking the suggested new trail routes. She made general recommendations to the National Park Service for constructing the trails. But most of all she emphasized the enjoyment both of blazing the trails and in the use of them by others. The work of this dedicated woman resulted in the opening in 1923 of the Howard Eaton Trail, used for decades by horseback parties. Parts of the trail are still in use, both by riders and pedestrians. In Yellowstone Treasures I recommend the part of this trail that goes from Swan Lake Flat toward Mammoth Hot Springs, and I mention several other segments of the trail.